With a solid reputation as a VoIP phone manufacturer, Fanvil offers a durable, feature-rich line of IP SIP Door Phones that are well suited for a variety of applications: residential, commercial buildings, multi-family, banks, manufacturing, factories, schools, prisons, mines, supermarkets, railway stations and logistics centers – just to name a few. Anywhere customers need high-quality, robust and efficient door communication systems, Fanvil has an excellent lineup of choices. The all-in-one Fanvil i20S SIP Door Phone supports remote DTMF, local password and RFID cards to open a door. 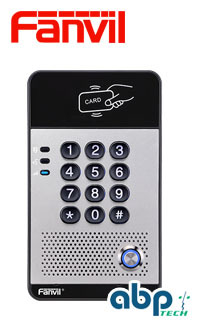 With a numeric keypad design, users can use the dial pad to dial a call where the door is open by a proprietor or dial by password which provides an auto door open. The Fanvil i20S SIP Door Phone can be integrated with an IP video camera to create a video door phone. With Smart Network Configuration, end users can use an IP video phone, PC or SIP softphone application to talk with visitors or establish remote monitoring. Application scenarios include office security and or access, logistic center security access or apartment security control. For office security access, end users present an RFID credential or password to open the door. Two-way communication or remote controller opens the door. Logistic center security access allows authorized employee access only. There is also two-way communication between visitors and center administration and support for using a remote controller to open the door. Apartment security control uses two-way communication which makes it more convenient for end users. Doors can also be opened by remote controllers for simple operation and access. Fanvil also offers video options for both Door Phones and Intercoms. Read more about video features, here. Other Articles about FanvilUpgrade Fanvil X6/X5S With the Latest Firmware VersionMejore sus porteros e intercomunicadores con videoEnhance Your Door Phones and Intercoms With VideoFanvil Intercoms Provide Solutions For Any Two-Way Communication NeedsLos Intercomunicadores de Fanvil Proporcionan Soluciones Para Cualquier Necesidad de Comunicación bidireccional.Fanvil ofrece porteros IP SIP duraderos y con múltiples funcionesFanvil Delivers Durable, Feature-Rich IP SIP Door PhonesFanvil se basa en los éxitos de VoIP para ofrecer porteros IP Crystal Clear e intercomunicadores SIPFanvil Builds on VoIP Successes to Deliver Crystal Clear IP Door Stations and SIP IntercomsFanvil IP Door Stations and SIP IntercomsFanvil "X" Series: Simply All That's Needed in an IP PhoneHow to Fix 3CX v15 and Fanvil Phone BLF IssuesWhy Choose Fanvil Phones?